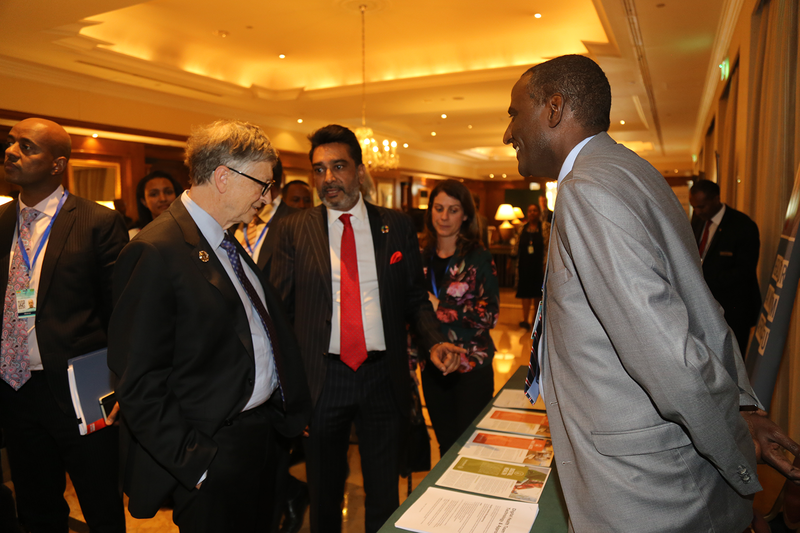 IntraHealth's East Africa regional director Ummuro Adano (right) talks health investments with Bill Gates (left) and Africa Health Business chair Amit Thakker (center left) last weekend at the Africa Leadership Meeting: Investing in Health. Photo by Tervil Okoko for IntraHealth International. The global landscape of development assistance for health is rapidly changing: donor funding has plateaued, and many middle-income countries in Africa have either transitioned or are rapidly transitioning toward self-sufficiency and an end to financial backing from external donor organizations—a process that has also been called “graduation” from donor assistance. Domestic resource mobilization, smart partnership with the private sector, and equitable financing for universal health coverage dominated the agenda of the first Africa Leadership Meeting: Investing in Health on February 9, 2019, at the 32nd Ordinary Session of the African Union Summit in Addis Ababa, Ethiopia. Clearly, beyond the medium-term, African countries can’t rely on aid to fill their health spending gaps. The global aid budget isn’t growing and fluctuates depending on the changing priorities in donor countries. We will get better results if we work together as a continent. If countries are to develop effective and equitable health systems, governments in the region need to raise much of the required money by expanding their own progressive tax systems, reorienting their health systems, and collaborating with the private sector and money markets. Kagame, the outgoing chair of the African Union, led the meeting of 400 delegates, which included Prime Minister Erna Solberg of Norway, President Mahamadou Issoufou of Niger, President Uhuru Kenyatta of Kenya, United Nations Secretary-General António Guterres, World Health Organization (WHO) Director General Tedros Gebreyesus, and Bill Gates, cochair of Bill and Melinda Gates Foundation. Ethiopia's President Sahle-Work Zewde (left) visits IntraHealth's booth during the high-level side event last weekend. Photo by Tervil Okoko for IntraHealth International. Heads of state at the meeting urged governments and members of the private sector from across Africa to work more collectively to fund health care systems on the continent. The leaders said that governments across Africa should be willing and able to increase domestic investment in health care if they work together. Missing from the discussion were proven examples of partnership models that are ripe for scale-up. For example, countries should aim to collect around 20% of GDP into the government budget. Of this, governments will need to commit at least 15% of their budgets to the health sector to meet the Abuja Declaration targets—and spend at least $86 per person per year (the WHO target for universal health coverage in low-income countries) in delivering a minimum package of health services. Ensuring just a 4% increase in tax collection and administration efficiency, the leaders said, could produce $4 billion in additional tax revenues—without raising taxes. Although all the speakers urged the private sector to play a role beyond paying taxes and philanthropy and to invest more in providing health services, what was missing from this inaugural meeting were proven examples of smart partnership models that are ripe for scale-up—especially in the critical areas of regional bulk purchasing of medicines and supplies, harmonizing regional regulatory frameworks to streamline market entry requirements, and access to credit and money markets for private care providers. Such models would encourage more private-sector actors to invest more in the business of health care as service providers. Companies can also be more involved by ensuring their employees have high-quality health insurance coverage. This will create more demand in the market, free up public-sector resources, and allow governments to focus on the most vulnerable segments of the population. This meeting on financing health care across Africa took place at a critical time. It is also essential for African Union member states to track progress on their investments toward the health outcomes enshrined in the AU Agenda 2063 and the Sustainable Development Goals. The African Union Commission is developing a progress tracker tool that will help in this process. This inaugural high-level meeting on financing health care across Africa took place at a critical time. The continent is entering a period where most of its special global health financing vehicles, such as Global Fund and Gavi, must replenish their resources. In his remarks, Bill Gates cautioned that worldwide partnerships for health will be tested in the coming years and equity will become more important than ever. While it was short on specifics, the meeting issued a brief call to action that encourages African leaders to increase their commitment and ownership of the process of domestic resource mobilization and improving health care. This will allow them to not only save lives but also grow their economies and achieve prosperity through smarter partnerships with the private sector that help build resilient national health systems. These systems will be characterized by strong primary health care and universal health coverage, and by the well trained, available, and supported frontline health workers—especially community health workers—who provide those services. But to truly graduate from donor assistance, we need increased and targeted domestic and external resources in these areas—and we need them today.